Asking questions about how to invest, where to invest, and what to look for, can bring you many answers from lots of different sources. The concern is diving through all the clutter to discover appropriate information to fit your requirements. 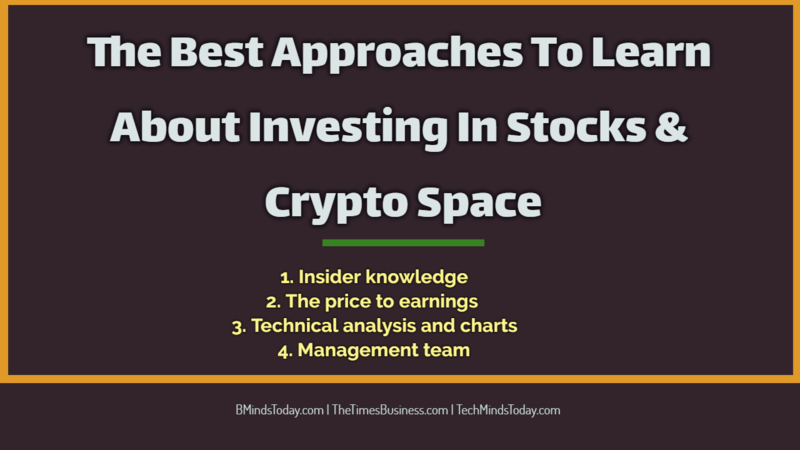 So when looking to invest in the stock or crypto market, where should you begin? You as a first step should start by investing in projects or companies that are aware of. If you are trying to evaluate a company or project, make sure you know how it works. You should take some time to learn about the company or project you are willing to invest in because it provides a basic idea on company’s performance in the market. If you don’t have any idea about the business model, what the company does on a day to day basis, or how it generates revenue now, and in the future, then you better stay away from it. Once you know the types of companies to look for, you’ll need ideas. Message boards, newsletters, financial news shows, and stock screeners are all good places to find ideas. So you’ve found some projects or companies worth looking into, what next? This is anyone who is considered to have an inside knowledge of the company, and also has money invested in company stock. Observing when the insiders buy and sell stock, and at the prices they do it, can be very useful in predicting a stocks or coins future. You don’t want to buy a large stake in Company X when all the people running it are getting out. Therefore it’s always a good idea to watch what the “smart money” is doing. The price to earnings ratio can also be a beneficial tool in evaluating a company. The P/E ratio will tell you if the company is relatively undervalued, or overvalued. A company that is undervalued should have a P/E ratio that is lower than other stocks in their Sector. This is a great value to plug into a stock screener to find profitable companies. Note: P/E can be manipulated. Also P/E ratios vary wildly depending on the sector you are looking in. Whenever you evaluate a stock, you better avoid looking at the P/E against all other companies, but prefer looking at it against their competitors in the same sector. This is another tool that can help you see where a company has been, where the company stands now, and where it’s headed in the future. It shows the company in a graphical form where you can see the stocks activity and volume over a period of time. Some people just look at earnings, charts, and other technical ways of evaluating a company or project. This isn’t always a bad thing but to really know about a firm, you should know the management. You should know what other companies or projects they have been involved with in the past, and how they did when they were there. You should also know where they plan to take the company you’re evaluating, and in what length of time they have allocated to reach there. In order to become knowledgeable pertaining to market trends, you then should focus on doing homework on this topic. You should also focus on noting down your financial goals, and when in doubt, take professional advice from someone who has already accomplished what you are trying to do. Knowledge gives you more power.